Parents don’t vibrate like a bouncy seat or swing like a swing. They bounce and sway, and that’s what the 4moms mamaRoo® does: it moves like you do. It’s the only infant seat with five unique motions – Car Ride, Kangaroo, Tree Swing, Rock A Bye, and Ocean – that mimic the natural movements parents make to comfort their baby. 4moms Mamaroo is a Bluetooth connected smart baby sling or bassinet. It basically imitates the way parents rock their babies while putting them to sleep or soothing them while they are crying. The Mamaroo has a shallow seat and nylon seat fabric. The sling comes with an infant insert, which is soft and made of cotton cloth. Both the seat fabric and infant insert are easy to remove and machine washable. The overhead toy mobile has removable toy balls. The mobile ball inserts are reversible. They can be flipped from black and white to color. Although the mobile balls are attractive, lightweight, washable and safe even if they fall on baby, the baby gets bored of them easily. The Mamaroo has adjustable seat recline. It reclines to multiple positions to allow baby to lie back and relax or sit up and play when they grow little older. 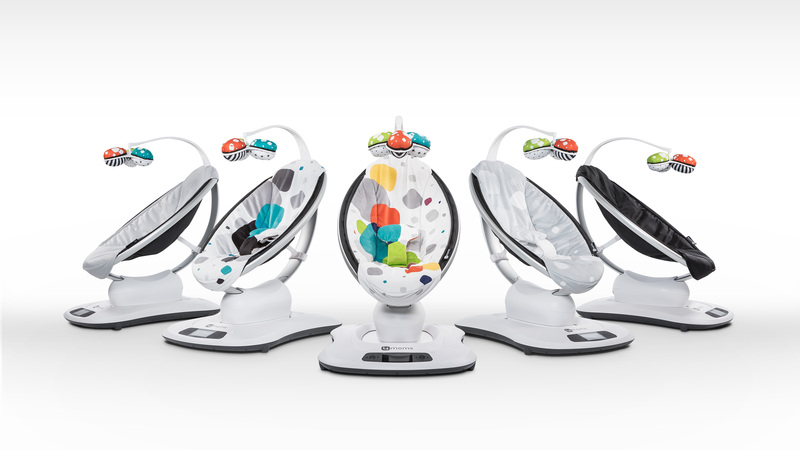 Mamaroo has 5 movement settings: car ride, kangaroo, tree swing, rock-a-bye and wave. It also has 5-speed settings. Unlike the traditional swings, Mamaroo’s motion evolves directly from the base in varying directional rhythms. The motion, volume and speed controls are all at the same place at the base of the sling. It is very easy to operate the sling manually. The small display screen on the base shows what option we are selecting or adjusting. The motion, sound, speed and volume can also be controlled remotely using Bluetooth enabled smart device. The overhead toy mobile handle rotates 360 degrees. Thus, it does not become an obstacle while putting the baby in the seat. The Mamaroo comes with an AC adapter for power source and saves us from the hassle of frequently changing the batteries. 4moms Mamaroo is sleek and modern in appearance. Although Mamaroo with plush seat seems very comfortable than the classic version, it can easily get dirty. We preferred the classic version as it comes with all the features and the seat fabric can be wiped cleaned. You don’t have to machine clean it all the time. We got the infant insert instead which fits on top of the nylon fabric and our baby finds it very comfy. Unlike other slings, Mamaroo takes very little space while in motion. When in action the sling is not completely silent. But the operating sound is not loud and is preferable to identify when the sling is in motion and when it is idle. It does a great job of soothing our baby and putting her to sleep. The overall quality is good except the speakers. We think 4moms could have provided speakers with better sound quality. The 3 point harness is sufficient to hold the baby on the sling. The harness is designed such that it ties the seat and the infant insert together for maximum safety. The overhead toy mobile balls are soft and lightweight which ensures baby is not harmed even if they fall on her. However, once your baby can sit up on her own you cannot leave her alone in the sling. For this reason, Mamaroo is ideal to be used for babies up to 6 months. After that, it can be used on a need basis and until the age your baby enjoys the sling. Sound quality is just ok. The speakers have low sound but they get the job done. The Mamaroo comes with 4 built-in sounds (ocean, rain, heart beat and white noise) and an MP3 plug-in, which you can attach to your mobile and play your favorite songs. However, the cord to connect to the mobile is very short. We found the sound quality and short cord disappointing. The AC adapter or electric cord provides the power source. No batteries required. 5 inches screen display at the base. Motion, sound, speed and volume can be controlled using Bluetooth enabled smart device. Ideal for babies up to 25 lbs or until your infant can sit up without assistance. It really depends on each baby’s preference. For some it works for others it may not. Before buying 4moms Mamaroo we checked online reviews and discovered that for many infants the sling did not work. Luckily, it worked for our daughter. The Mamaroo gave us a parenting assistance to rock our baby to sleep and let us walk around the house hands-free. We loved the fact that the various features can be controlled remotely using Bluetooth. It is bit expensive because of its high tech features. Some might also consider investing money in Mamaroo as it cannot be used longer than 9 months. Finally, I would say that 4moms Mamaroo is worth the value only if it works for your baby.